Descubra a mística dos pântanos e bayous em um passeio de barco de Nova Orleans. Viaje pelo fundo do rio Mississippi para testemunhar a vida cajun e avistar a vida selvagem nativa. Seu guia fornecerá comentários sobre a cultura cajun e os pântanos carregados de mitos enquanto você tira fotos de jacarés, guaxinins, cobras, tartarugas e pássaros nativos. Escolha uma manhã ou tarde pickup do French Quarter e suba a bordo do seu treinador para o passeio profundo no país Cajun. Observe o cenário em mudança à medida que a paisagem urbana transita em grandes áreas úmidas. O seu treinador leva você ao ponto de partida pelo rio Mississippi, onde você será transferido para um barco coberto e aberto e partirá para o passeio divertido e educativo. Seu guia nativo irá levá-lo em uma expedição de 2 horas de vida selvagem através deste lendário terreno da Louisiana. Deslize ao longo da água, vendo a vegetação exuberante e abundante vida selvagem local, incluindo jacarés, garças, guaxinins, cobras e nutria gigante. Alguns animais selvagens são mais facilmente vistos durante os meses mais quentes do ano. Obtenha ótimas fotos e aprenda sobre a história e o mistério dos pântanos, incluindo a cultura e a engenhosidade do povo Cajun que habita esta região há quase 250 anos. 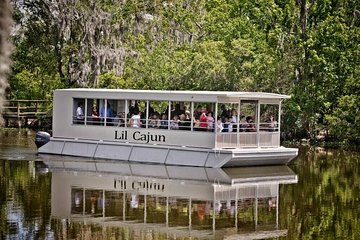 Seus guias compartilharão histórias sobre música Cajun, estilo de vida bayou e tradições culinárias - como a criação do gumbo exclusivo da Louisiana, bem como informações sobre os esforços apaixonados da região para preservar as zonas úmidas. Seu treinador retorna ao French Quarter no meio da tarde ou da noite. Informative with a great guide who not only provided detailed information on the bayou but an alligator!! I booked this tour based on previous reviews and it did not disappoint. The tour guide provided basic as well as the kind of information that only someone who lives in the area or who did his research to e knowledgeable. The boat was spacious with adequate seating. The tour was just long enough to be enjoyable. Swamp tour was good even though we only saw only one alligator. There was no boat ride from New Orleans. They said they didn't do this and took us by bus. I questioned my wife about this tour when she booked it because we were traveling with our 9 and 16 year old grandsons. From start to finish it was excellent. The swamp tour was one of the best tours we ever been on. Super visite, très sympa, mieux qu'en aéroglisseur qui font beaucoup de bruit. My husband and I enjoyed tooling along in the bayous, spotting alligators and watching them jump for marshmallows (though we thought marshmallows might not be the best diet for their ongoing health). The boat was not crowded, which was pleasant. The tour guide was knowledgeable and personable, and had a baby alligator with him that was a rescue, which was interesting. At the beginning of the ride when many boats were taking off at once, we had trouble hearing our tour guide. This tour is great! It picks you up and drops you off at a central location in NOLA. The tour guide was friendly and personable. He made sure we saw many alligators. He even gave us the opportunity to hold a baby alligator! The boat was covered so the harsh sun did not overwhelm us and we felt safe the entire time. We had a great time. I definitely recommend this tour! The bus ride out to the swamp was about 30 minutes and was comfortable. We waited 15 minutes on a dock before they let us board the boat. I'm very happy we did this tour vs the very loud air boats. This was a nice peaceful boat ride which gave you time to really sit back, enjoy the local radio music, tour narration, and enjoy the sites. We saw lots of alligators which was enjoyable as they swam right up to the boat. They had a baby alligator for everyone to hold on the boat if you wanted. Our tour guide wasn't very personable, but did a good job explaining the area and history. 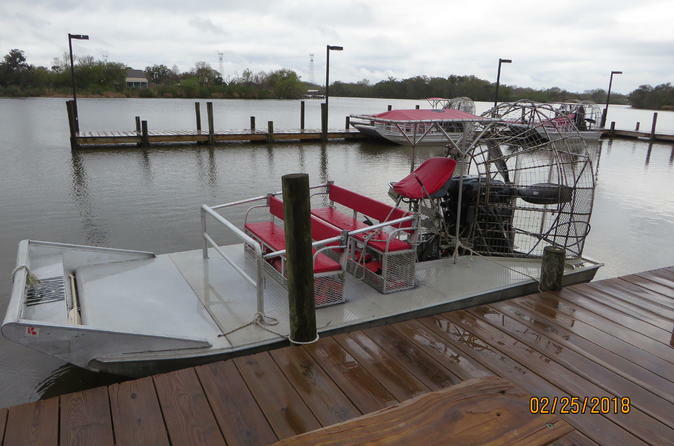 I wish this tour left at a different time then the air boats on the same dock because it was pretty annoying when they whizzed by with their large waves and spray. Overall it was an enjoyable morning. Everything was great! The only thing that seemed a bit weird was that they feed marshmallows to the alligators !? Very nice tour. Nice guide. We were so close to alligators, big and small ones. It was great!. I took great pictures.